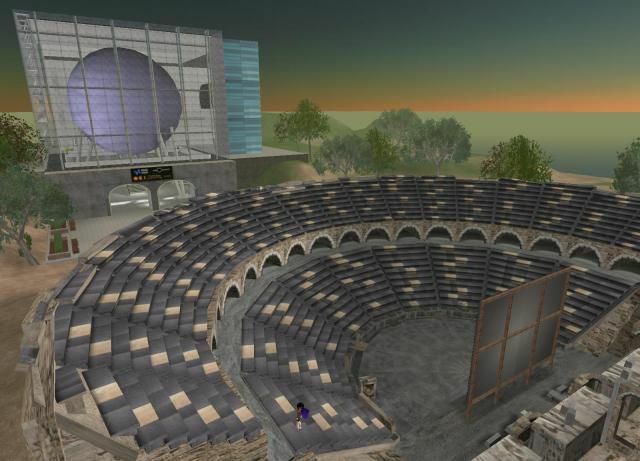 On this project, Aimee worked closely with the Exploratorium Museum in San Francisco to create a virtual event for the March 29th, 2006 solar eclipse in Side Turkey. The build included an educational eclipse museum and a beautiful replica of the Roman theater in Turkey where famed science celeb Paul Doherty hosted the event. Interactive learning exhibits educated visitors about how solar eclipses work and how the rotation of the earth combined with the orbit of the moon to create the resultant eclipse path across the surface of our planet.